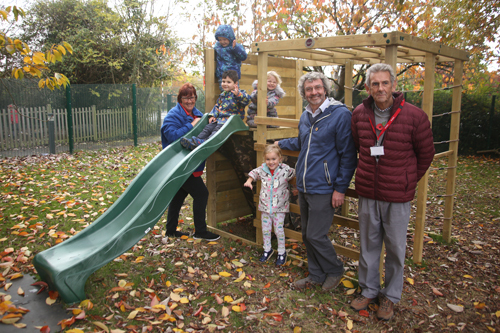 Children at First Step preschool are enjoying a new climbing frame, thanks to Thornbury councillor David Chubb. Mr Chubb donated £650 from his Member Assisted Funding to buy it so that children had something to play on outside. The preschool opened its new home in April, after a bumpy start. The building project had been given a £225,000 grant from the Department for Education, with the project committee planning to raise the remainder. But it turned out that the VAT couldn’t be reclaimed, adding another 20% to the cost. The new, unfinished building was redundant for a while before the committee approached South Gloucestershire Council. It agreed to finish the project in return for ownership of the building.